As nationwide media coverage of flooding portrayed, the Great Plains were exceedingly wet this spring. While the abundance of moisture posed serious problems for farmers, ranchers, communities and infrastructure, it was a blessing on a grand scale for breeding ducks. Wetlands in North and South Dakota emerged from winter in excellent condition, which has been the case for the previous two years. In Prairie Canada, wetland conditions significantly improved from spring 2010 levels, buoyed by last summer's well-above-average rainfall and above-average snowfall. Yet despite, improved wetland conditions, mallards and pintail numbers in Prairie Canada continue to lag beyond the excellent water across the Prairie Provinces. Perhaps even more remarkable than the abundance of moisture was its broad distribution. Excellent wetland conditions existed all across the Prairie Pothole Region, from southeastern South Dakota to Edmonton, Alberta, making the 2011 breeding season a nearly unprecedented event. 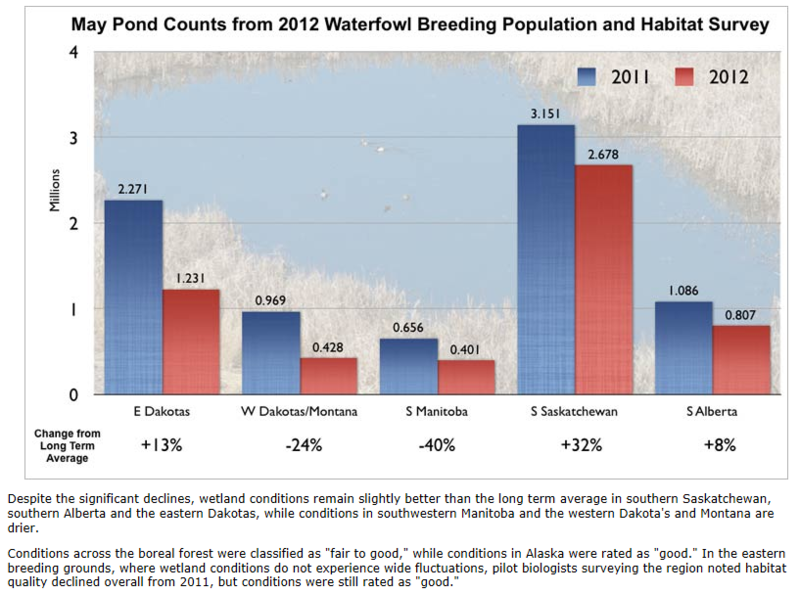 As many predicted, May Pond Counts (the USFWS means of assessing habitat quality during the Waterfowl Breeding Population and Habitat Survey) were the second highest levels ever recorded. As noted below, wetland conditions far exceeded their long-term averages everywhere but southwestern Manitoba. 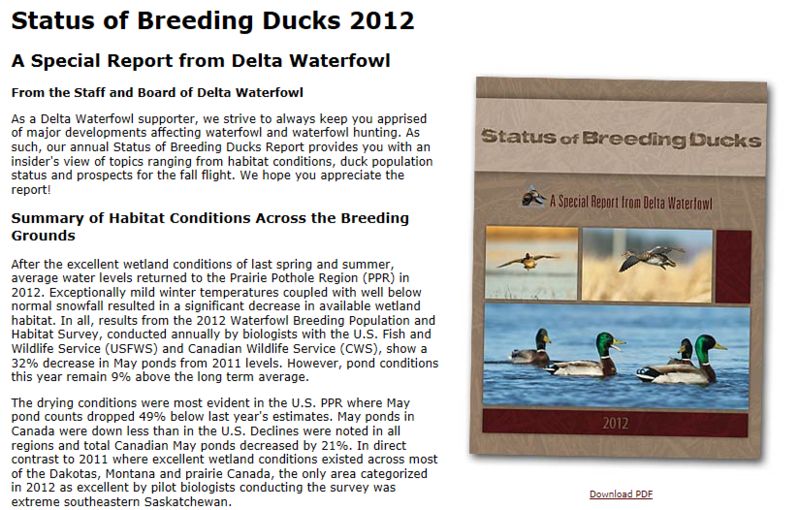 While wetland conditions were well above average during the time of the survey, Delta staff and others report wetland conditions continued to be excellent into mid July, with comments about the presence of temporary and seasonal wetlands sustained very late in the breeding season. This continued wetness should provide for a strong breeding effort and increased duckling survival. Beyond the Prairies, with the exception of northwestern Alberta, the bulk of the breeding habitat was rated good to excellent. Nearly all areas of the eastern breeding grounds were rated as excellent by observers and a significant improvement in habitat quality from 2010. Mallard numbers were up moderately from 2010 and above the long-term average. In terms of duck distribution, the large gains in populations were centered on the prairies where excellent wetland conditions attracted the bulk of the breeding ducks. The eastern Dakotas, buoyed by a nearly continuous wet cycle since the mid 1990's and ample nesting cover provided by CRP and existing native grasslands, continued to attract ducks far beyond historical levels. Mallard numbers in the eastern Dakotas were 170% above the long term average and pintails were 209% above the long-term average. All duck species in the eastern Dakotas were more than 100% above their respective historical averages. While excellent wetland conditions are attracting ducks to the Dakotas, perhaps a more significant contributor is the long period of productivity as a result of abundant nesting cover in the Dakotas. Documented high hatching rates in the U.S. Prairies as a result of CRP has provided excellent production and resulting high populations. In contrast, southern Saskatchewan and southern Alberta, while faring well in terms of the long-term averages for most species, continue to lag behind for mallards and pintails. 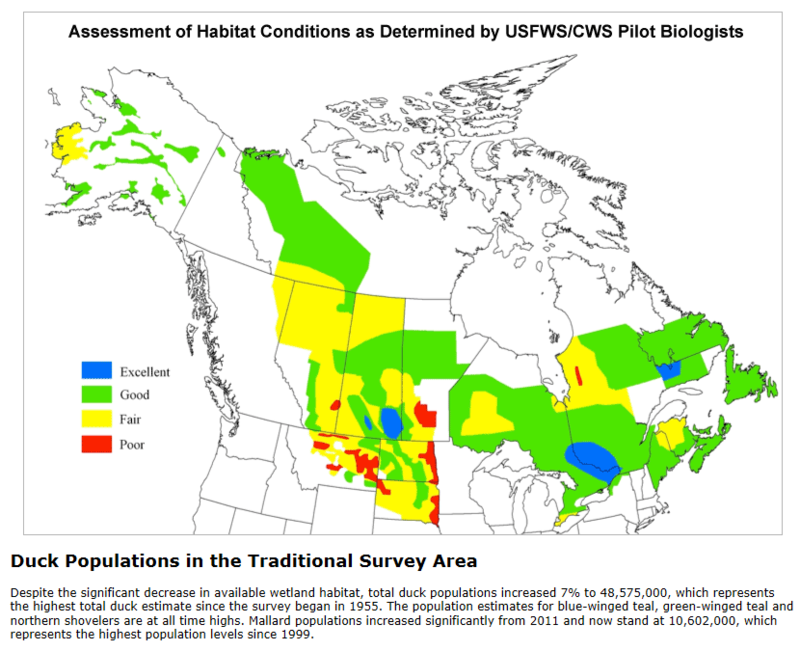 While wetland conditions in Saskatchewan and Alberta are well above normal (57% and 47%, respectively) mallard numbers are merely at average in Saskatchewan and 12% below average in Alberta. Pintails show similar trends with both provinces having slightly below average populations despite excellent wetland conditions. This pattern is concerning because Alberta and Saskatchewan are two of the most important areas of the Prairie Pothole Region and their ills ultimately affect continental populations as well as the fall flight. The ongoing wetland losses (wetland loss rates in Canada are the same as they were 20 years ago) as well as dismal hatching rates across the parklands, are likely suppressing mallard and pintail populations. Pintails and mallards are early nesters, meaning they suffer from predation to a greater degree than other species and their early nesting strategy also relies more heavily on temporary and seasonal wetlands-wetlands that are being lost at the greatest rate. While wetland habitat was classified as excellent across the majority of the eastern breeding grounds, habitat and duck populations in those areas tend to be more stable and less prone to the "boom or bust" scenarios that frequently occur in the Prairies. USFWS population estimates for the eastern survey area showed mallards, goldeneyes and mergansers up slightly from last year and black ducks, ring-necks and green-winged teal down slightly. In addition to the large surveys conducted by the U.S. Fish and Wildlife Service and Canadian Wildlife Service, individual states also conduct statewide breeding duck inventories for tracking state population trends and accessing habitat. Today, these surveys are integrated into the regulations process. In the upper Midwest, Minnesota, Wisconsin and Michigan all conduct breeding duck surveys, as does California. While Michigan's population estimates were not available at printing, the following are summaries of state surveys. The Wisconsin survey indicated improved habitat conditions and total duck numbers were up 33% from last year and 17% above historical averages. Mallards in the Badger state were largely unchanged from last year. Habitat conditions in Minnesota were also improved with one of the highest pond counts on record. Total duck numbers in the State were 687,000, up 30% from 2010 and 11% above the long-term average. Mallard numbers increased to 283,000, up 17% from last year. Out west, the California Department of Fish and Game reported habitat conditions to be good to excellent across most of the state's breeding range and the improved habitat provided for a small increase in total breeding ducks, from 541,300 in 2010 to 558,600 this spring. Mallard numbers decreased from 367,900 to 314,700 and are slightly below the long-term average. The universal good to excellent wetland conditions across the varied breeding habitats should bode well for a good fall flight. Reports indicate a strong re-nesting effort on the prairies and excellent water conditions late in the summer should provide for very good duckling survival. 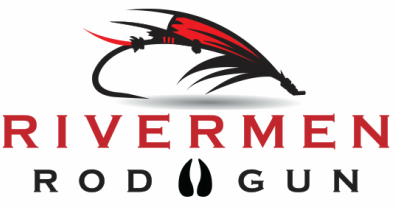 Good production and high populations for most species in most regions should provide for a very good hunting season with the caveat that local hunting conditions could significantly affect local success. It is important to note, however, that much of the good news this year and in recent years is attributable to good duck production provided by abundant upland nesting cover in the U.S. Prairies, thanks to the Conservation Reserve Program (CRP) and native grasslands. Ducks have fared extraordinarily well in the U.S. prairies, where a long period of above-normal pond counts and plentiful cover has yielded staggering duck numbers. In recent years, participation in CRP is waning and native grasslands have been lost, setting back the duck production potential of the U.S. Prairies. If the loss of CRP and other grass continues (as projections show for several years to come), the "boom years" of duck production in the Dakotas could be a memory. With the current budget debates, CRP is continually in the crosshairs for reduction and going into the next Farm Bill, duck hunters and the conservation community will have to fight hard to save CRP. In Canada, ongoing wetland loss and chronically low duck production are showing consequences for mallards and pintails, while most other species are faring well. The recent trend of mallards and pintails not tracking ponds in Prairie Canada is a clear indication that problems remain in the Canadian Duck Factory and new solutions are needed to bring the region back to its former glory. Nest success continues to be horribly low across large areas of Prairie Canada, with areas such as the famed Minnedosa pothole country rarely seeing nest success rates higher than 5%. Nest success this low weakens the fall flight and begs for new remedies. So while we should revel in this year's good news (and with any luck all of us will see plenty of ducks overhead this fall and winter), some real challenges remain. Please know that Delta, through our research, duck production work, pioneering efforts on Alternative Land Use Services (ALUS) and work on the CRP and the U.S. Farm Bill, is working hard on your behalf!